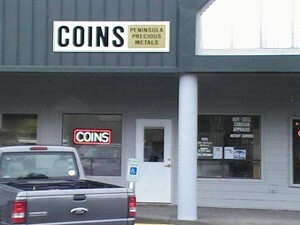 Peninsula Precious Metals is a coin dealer in Port Hadlock-Irondale, Washington that offers an ever-changing inventory of collectible and bullion coins, largely on eBay. 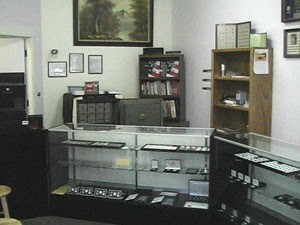 Just some of the coins and other products this Washington coin dealer may be offering at any given time include Lincoln wheat cents, Indian Head cents, Barber coinage, Morgan and Peace silver dollars and other pre-1965 U.S. silver coins, U.S. Mint uncirculated and proof sets, pre-1933 U.S. gold coins, foreign coins, and certified coins. Peninsula Precious Metals also offers U.S. Mint proof and uncirculated sets, silver and gold bullion coins, bullion bars, and more. 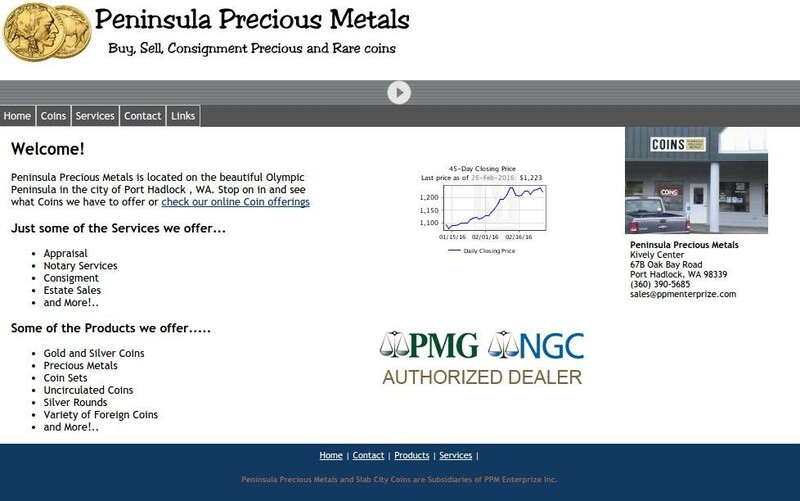 No matter what coins collectors or investors are looking for, they can rest assured that when they choose Peninsula Precious Metals they will receive outstanding service from a team of highly knowledgeable, courteous numismatic professionals. The owners of the coin shop, who have many years of numismatic experience, want every customer to be completely satisfied with the products they order and always provides excellent customer service.